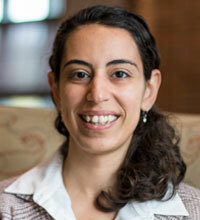 Dr. Farag, whose love of languages led her to a degree in linguistics from Harvard, is fluent in both English and Egyptian Arabic, with advanced knowledge of German, and reading knowledge of French, Arabic, Coptic, Greek, and Latin. With this background, her graduate work at Yale focused on liturgics and Ancient Christian Studies, and she was awarded her PhD this spring with her dissertation, Sacred Things: The Legal Making of Churches in Late Antiquity. Farag is active in educational work in Coptic and Eastern Orthodox parishes, and she has served with ministries for imprisoned women, and on behalf of Amnesty International. Farag's research focuses on the history of Christianity in late antiquity, particularly the liturgical and regulatory practices of church leaders, with attention to material culture. Her geographic specialty of Egypt often leads her abroad to study Coptic and Arabic manuscripts and participate in archaeological projects.